Description: At a party some guy decides to light his drink on fire and down it! This dude really is lucky that he did not get seriously hurt! 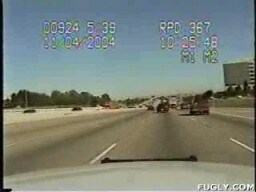 During a police chase, the suspects open fire on the police with automatic weapons. Whether you call it parkour, free running or freestyle running the guys in this video do an awesome job of it. This is the best one I have seen so far.